The biblical topic of baptism is complete in three areas: 1. The Subject—A penitent believer. Infant baptism is not found in all the New Testament. 2. The Purpose—Forgiveness of sin. 3. The Action—a figurative burial by immersion in water. These three divisions exhaust the subject of baptism as a condition of salvation from sin. It is the action of baptism that we wish to amplify in this essay. While reading the story of the Rich man and Lazarus in Luke 16, I was struck by the statement of the Rich Man who was suffering in Hades. He asked father Abraham to send Lazarus over that he might dip his finger in water and cool his tongue, for he was tormented in a flame (Luke 16:24). When I consulted the original language, bapto was the word translated by dip. Why did the translators put dip for bapto, but will not translate baptidzo by dip, or immerse? This would have alleviated a lot of confusion on the action of baptism. But, while studying this point an excellent illustration will confirm the truth that baptism is by dipping, plunging, or immersing the subject in water. This truth is taught so plainly in the New Testament (Romans 6:1-6; Acts 8:36-38; Colossians 2:12). The Greek poet and Physician Nicander of Colophon [This city would be in the present day Turkey], who lived about 200 B.C., unwittingly confirmed the Biblical language. He described a recipe for making pickles by using both the word bapto and baptidzo. In order to make a pickle, Nicander says, the vegetable should first be ‘dipped’ [bapto] into boiling water and then the same should be ‘baptized’ [baptidzo] in a vinegar solution. In the case of the ‘pickle,’ there was a double dipping. Both of these Greek verbs involved immersing vegetables in liquid solutions. 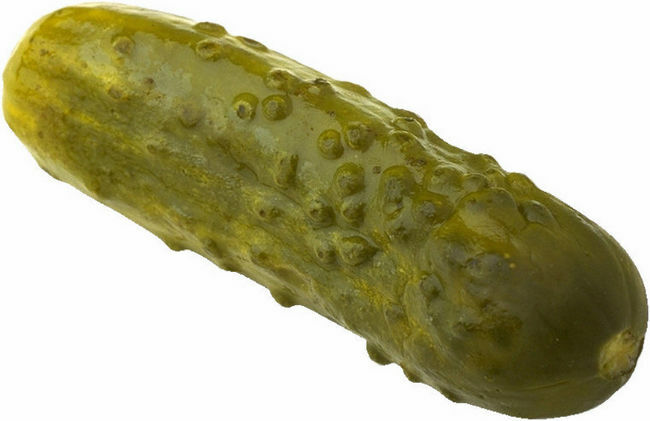 In the case of the pickle, the dipping in water was temporary, while immersing it in the vinegar solution was complete and produced a permanent change. It would never taste like a cucumber again. The point made is that both the dipping the finger in water to cool the Rich Man’s tongue (Luke 16:24), and immersing a penitent believer in water for the forgiveness of sin (Acts 8:36-38), describes the action of bapto and baptidzo. Our understanding and faith in water baptism does not stand in the testimony of Nicander, but in the inspired word of God (2 Timothy 3:14-16). However, the inspired biblical writers used the vocabulary that everyone was using at that time. It is the way God used these words in his revelation that makes the Bible unique. It is noteworthy that bapto [dip] and baptidzo [dip or immerse] had not changed their meaning in about 300 years. That is why Nicander’s testimony is corroborative of the biblical text. Some people, I am sorry to say, have only been dipped [bapto] in water like the pickle. They have not changed their life which baptism [baptidzo] demands. The “old timers” used to say of these people, “They sat down on the creek bank” after they were baptized. In other words, they just got wet. But that is not the fault of water baptism. It is the lack of commitment on the part of the one being baptized. While this is the case with some, by far most grow in the grace and knowledge of our Lord Jesus Christ and remain faithful throughout their life. Water baptism [baptidzo—immersion] of the penitent believer is analogous also to the immersion [baptidzo] of the pickle, in that baptism is designed to produce in the subject a permanent change of relationship to the Lord. Paul declared to the Corinthians that if any man is in Christ he is a new creation (2 Corinthians 5:12). That person baptized into Christ is a new creature (Galatians 3:26-27; 6:15). The baptized into Christ are therefore obligated to figuratively put to death the old man of sin, bury him away forever and rise to walk in newness of life (Romans 6:1-6). Just an intellectual assent is not enough. The last words of Jesus before he went back to heaven were: “Go into all the world and preach the gospel to all creation. Whoever believes and is baptized will be saved, but whoever does not believe will be condemned” (Mark 16:15-16 NIV). It takes both belief and baptism to be saved, but only unbelief is required to be condemned. Amen!